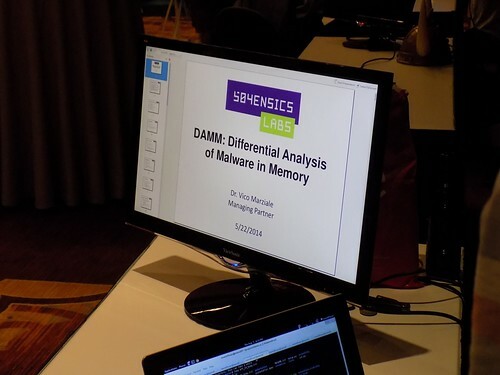 Differential Analysis of Malware in Memory (DAMM) is a tool built on top of Volatility Framework. Its main objective is as a test bed for some newer techniques in memory analysis, including performance enhancements via persistent SQLite storage of plugin results (optional); comparing in-memory objects across multiple memory samples, for example processes running in an uninfected samples versus those in an infected sample; data reduction via smart filtering (e.g., on a pid across several plugins); and encoding a set of expert domain knowledge to sniff out indicators of malicious activity, like hidden processes and DLLs, or windows built-in processes running form the wrong directory. python damm.py -h usage: damm.py [-h] [-d DIR] [-p PLUGIN [PLUGIN ...]] [-f FILE] [-k KDBG] [--db DB] [--profile PROFILE] [--debug] [--info] [--tsv] [--grepable] [--filter FILTER] [--filtertype FILTERTYPE] [--diff BASELINE] [-u FIELD [FIELD ...]] [--warnings] [-q] DAMM v1.0 Beta optional arguments: -h, --help show this help message and exit -d DIR Path to additional plugin directory -p PLUGIN [PLUGIN ...] Plugin(s) to run. For a list of options use --info -f FILE Memory image file to run plugin on -k KDBG KDBG address for the images (in hex) --db DB SQLite db file, for efficient input/output --profile PROFILE Volatility profile for the images (e.g. WinXPSP2x86) --debug Print debugging statements --info Print available volatility profiles, plugins --tsv Print screen formatted output. --grepable Print in grepable text format --filter FILTER Filter results on name:value pair, e.g., pid:42 --filtertype FILTERTYPE Filter match type; either "exact" or "partial", defaults to partial --diff BASELINE Diff the imageFile|db with this db file as a baseline -u FIELD [FIELD ...] Use the specified fields to determine uniqueness of memobjs when diffing --warnings Look for suspicious objects. -q Query the supplied db (via --db). --tsv Print screen formatted output. --warnings Look for suspicious objects. -q Query the supplied db (via --db). See the warnings.py file for much more information on what DAMM checks for.